From the very first minute they hit you with the perfect mix of darkness and tight spaces to create the atmosphere I feel has been missing from most Resident Evil games since after RE3. Don’t get wrong, RE7 was really cool, but it was so strictly scripted that a second run isn’t even creepy. Plus I thought the Molded were really boring enemies and I wish, if they insisted on going that route, that they would have brought back the Ooze from Resident Evil Revelations. Anyway, the first zombie I encounter has me like, “oh, a zombie. No problem I know how to fix this!” And I pop a bullet in its head really quickly only to find it doesn’t go down. At all. Like, it doesn’t even seem to be bothered by the fact that half its face is missing. A couple more and I’m no better off, so I shoot it in the leg a couple times to knock it down instead. This works, and has even more fantastic results than I expected as the bloody things leg comes off! Now it just crawls along looking sad as I try to find my way out of the small room. As I leave I know it’s gonna be a good time. I played RE2 for about three hours yesterday and got out of the police station by the end of my session. Along the way I found the difficulty to be just about perfect as the action and enemies are intense enough to challenge without feeling like I have to resort to trickery just to get by. Resources are definitely scarce in the game, but they always seem to give a suitable supply of ammunition, healing items, and upgrades to make it doable on your first go around, at least as long as you’re careful. There’s only been one time when I felt the game was unfair and that was when I needed to get past Mr. X to acquire a puzzle item and he continually stood right in front of the door I needed to go through. I don’t know if this was just happenstance, but it was annoying to have to slowly bait him out to an area large enough to dodge around him. Other than that though I’ve had a great time with the different gameplay systems, particularly dismembering enemies to cripple them, as it reminds me of some of my favourite Dead Space memories. I’m not going to talk about the story very much for two major reasons. 1. I haven’t finished the game much less started a second run, so I haven’t seen the full story to talk about yet, and 2. In case any of you haven’t experienced yet by way of the original 1998 game, online play through, or actually playing it yourselves I want to avoid spoilers. 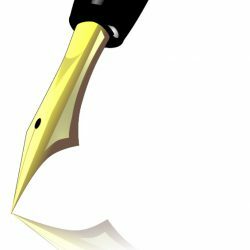 I will say, however, that it is very well done and the more serious and down-to-earth direction is a great fit for the story being told. 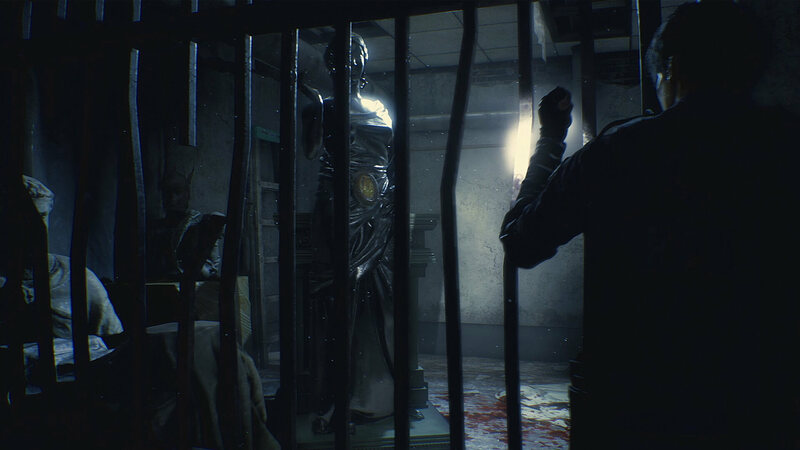 I have enjoyed the more over-the-top and comic book like approach that games like Resident Evil 6 took, but this really works and helps elevate the creepy atmosphere Capcom has worked so hard to create. 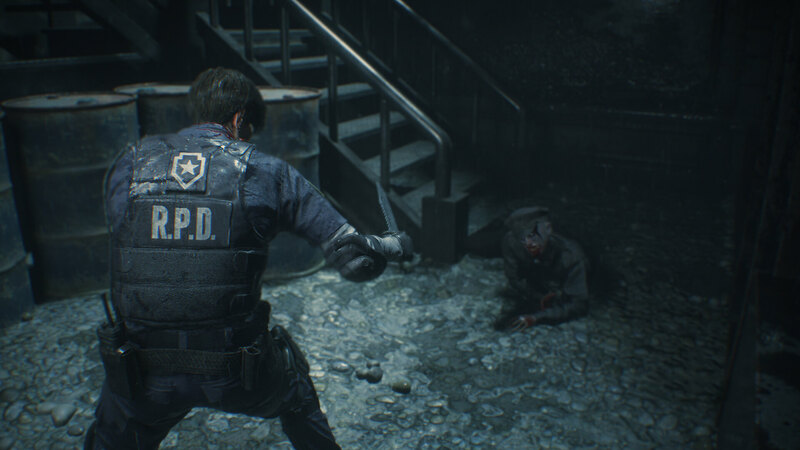 On the graphical side, Resident Evil 2 is very pretty. As I said at the top, I’m playing on Xbox One S, so the visuals aren’t as good as they could be on say an Xbox One X or a high-end PC, but what on display is stunning nonetheless. Well, maybe stunning is the right word since Raccoon City is an absolute wreck, but the game definitely looks really good with great texture work, beautiful effects, and a smooth frame rate whose dips only become noticeable when it jumps up to sixty in certain areas. The game is also very very dark in certain areas, leaving almost completely unable to see apart from what’s directly illuminated by your flashlight. While the effect is quite impressive and makes these parts of the game very foreboding, it also can make it a little irritating since the light cast is fairly narrow. When there are enemies this works well as it elevates the tension, but when everything is calm it just serves to make searching more difficult. Still, there’s no denying the game looks great and has fantastic art direction. Sound design is another area in which RE2 absolutely shines. The atmosphere of the game is mostly made up of the ambient sounds of the environment with only a few musical cues dotted around to give it some colour. 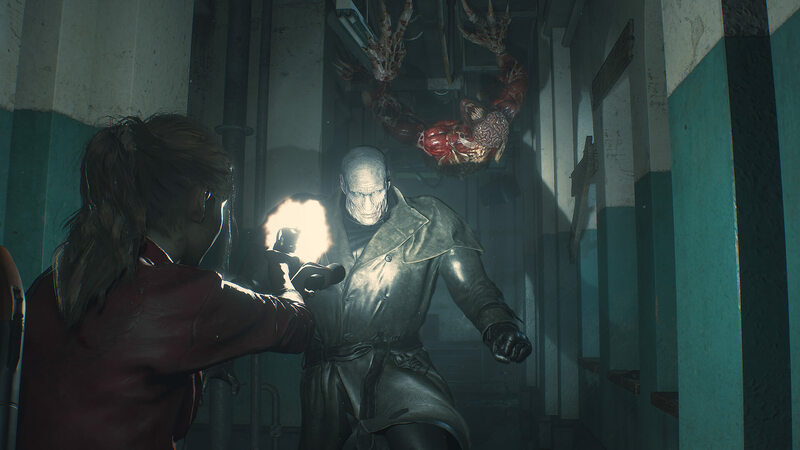 The main notable piece of music which is repeated frequently is the theme for Mr. X, which starts playing when he’s nearby to indicate trouble, as if his heavy footfalls weren’t enough warning. The sound effects are great and help augment the darkness I mentioned before as it means there will be times when the moaning of nearby zombies and their footsteps are all you have to indicate their presence before they get too close. What’s really impressive in a somewhat disgusting way is the crunch and squelch you’re rewarded with when blasting the limbs off of zombies. When you damage a limb enough for it to fall off, it doesn’t just immediately break. Instead, you’ll hear the snap of the bone and depending on what you broke you’ll hear it start to pull and snap away from the rest of the body. It’s n awful sound but at the same time it’s really satisfying and useful since it lets you know when you’ve done enough damage to get by the threat. The voice acting is also really good this time around, with each character sounding distinct and conveying emotion and personality quite well. The characters all have a more serious tone than the 1998 game, but it’s still got a little of the that slightly campy vibe from before. We are talking about a mega-corporation which makes mutant monsters, after all. Overall I’ve been having an amazing time with the reimagining of Resident Evil 2. I may not have ever finished the original, but that doesn’t mean I don’t have a strong appreciation for how important it’s been to the series overall. It’s clear Capcom took their time to do right by the legacy of the original game. I’m gonna go back to playing the game for…the foreseeable future, but for those of you who got the game over weekend I’d love to know what your experience has been with the game so far! Previous PostPrevious The reviews are great and OH GOD JUST GIVE ME RESIDENT EVIL 2 ALREADY!